The model 235 budget model is an impulse heat vacuum sealer. Perfect for vacuum sealing a wide variety of pouches from lightweight polyethylene to barrier bags. 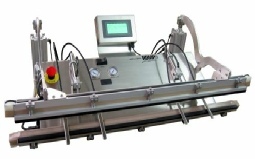 From our Budget Vacuum Impulse Heat Sealer, to Medical Vacuum Heat Sealer - Validatable medical vacuum heat sealer - impulse style, Also table top industrial vacuum heat sealer, and large industrial vacuum heat sealers.